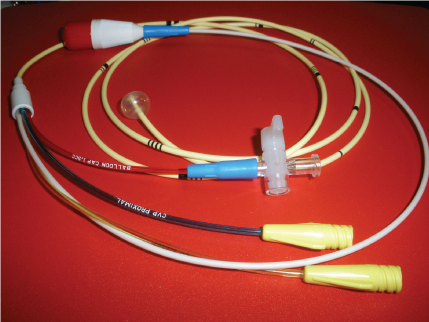 Thermodilution Catheter is made of extruded radiopaque polymeric tubing with four lumens in the catheter body. Thermodilution Catheter is made of extruded radiopaque polymeric tubing with four lumens in the catheter body. One lumen is to inflate or deflate the latex balloon which is located at the distal end. The proximal port is located 29 centimeters from the catheter tip. Thermistor port is located 3.5 centimeters from the distal tip. The distal lumen exits at the tip of the catheter, and is used for pressure monitoring.